FINALLY serve your homemade wine from a keg. The mini regulator and argon bulb are perfect for keeping wine fresh while serving! The stainless steel faucet is perfect for serving wine! FINALLY, now you can serve your delicious homemade wine from a keg. Our turnkey 5 Gallon Wine Kegging System comes with everything you need to serve 5 gallons of wine from a keg. You just provide the wine! The setup features a brand new 5 gallon ball lock keg, a mini high pressure regulator and ball lock gas disconnect, 26 gram argon bulb, and a ball lock stainless steel faucet assembly that fits right on the keg! Argon will not seep into the wine (like CO2), and is the perfect gas with which to serve wine. 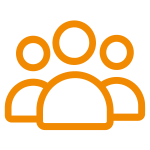 Argon is regularly used to purge the headspace in carboys to keep wine from oxidizing. The stainless steel faucet we've included has stainless steel parts that are more resistant to the acidic wine than chrome-plated brass faucets. 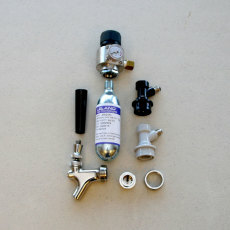 With this setup, you can keg your wine and enjoy it on tap without the fuss and muss of bottling. 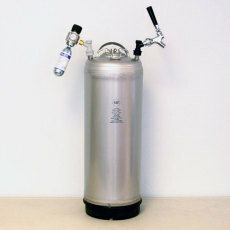 Be the hit of every party with wine in a keg! Have 5 gallons of wine on tap wherever you go! Compact design allows you to serve the wine with ease from home, OR take it with you to a party! Mini argon regulator and argon bulb allow you to serve wine while keeping the wine stable! Stainless steel faucet assembly is more inert than chrome plated brass - perfect for serving wine! 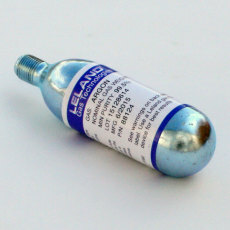 Mini argon/nitrogen regulator, that can also work with CO2.